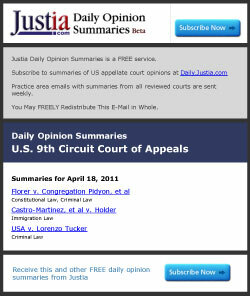 Courtney and I wanted to update you on our latest free law offering, Justia Daily Opinion Summaries. When we announced the launch last week, we noted that our jurisdictional coverage included all Federal Circuit Courts of Appeal and select state supreme courts. The team has been working hard to expand to even more jurisdictions and we’re pleased to say that we now offer summaries for over half the 50 U.S. states. To see a complete list of our current offerings by jurisdiction and by practice area, go to our subscription page at http://daily.justia.com. For the few remaining states that aren’t available yet, stay tuned. We’ll be adding more in the upcoming weeks.